To prepare hummus, grind together chickpeas, tahini, garlic cloves, salt, some chilled strained chickpea water and ½ cup olive oil to a paste. Add remaining olive oil and grind to a smooth paste. Divide the hummus into 4 equal portions and put in 4 different bowls. 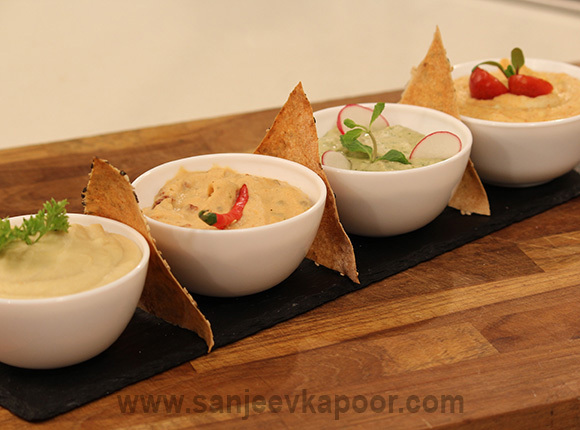 To prepare chutney hummus, add tamarind pulp and mint-coriander chutney to 1st portion and mix well. To prepare tomato hummus, add dried tomato powder to 2nd portion. Slice and add sun dried tomatoes along with lemon juice and mix well. To prepare avocado hummus, deseed, scoop out avocado pulp, add to 3rd portion and mix. Add lemon juice and mix. Add paprika and mix well. Put the plain hummus, chutney hummus, tomato hummus and avocado hummus in 4 different serving bowls and garnish each with a parsley sprig, slit red chilli, a mint sprig, halved cherry tomato, amaranth micro greens and red radish slice.